The man plucked a clucking, flapping chicken from a cage, held it firmly by the neck, and held it over a large blue bucket. He reached for a knife, held it to the throat of the bird, and cut it with one smooth motion before dropping the bird, furiously flapping in its death throes, into the bucket. My daughter, three years old turned to me in tearful bewilderment. “Why are they killing the chickens?”. I hadn’t intended for her to see this. We had come to buy coal for a barbecue and in this small mountain town it is only obtainable from the “murghi wallah”, the chicken seller. 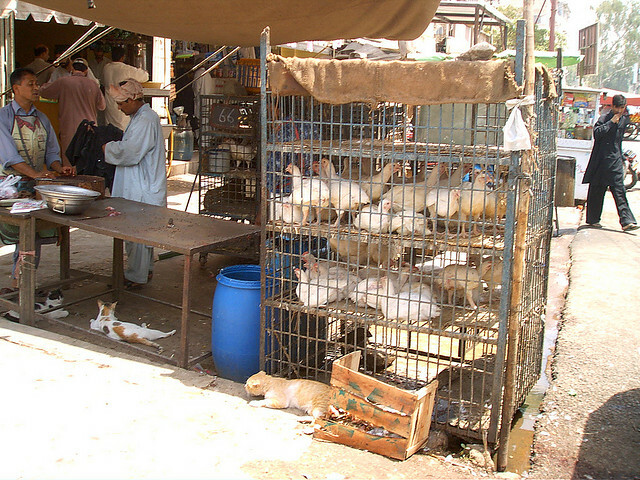 In Pakistan life is not as sanitised as it is in the West, where meat is purchased in sterilised, plastic-wrapped containers and the messy business of slaughtering is done in distant and anonymous warehouses. Here animals are killed in front of you – during the festival of Eid goats, sheep and even cows are slaughtered in driveways and in the streets – and I have come back from the bazaar several times clutching a bag of chicken pieces, still warm, with blood oozing out. I would prefer to shield my kids from the harsh realities of life. All of the books we read to our kids are unfailingly upbeat, with happy endings. Babies get lost and are returned, safe and sound, to their parents. Strangers are friendly and kind. Trains do not crash, the sun always shines, cats are cuddly and never scratch or bite. We present our kids with a vision of the world which is, frankly, unrealistic. And yet as responsible parents we also have an obligation to tell our children, as they grow older, that the world is not as safe as they might like to think. We teach them to be careful when crossing the road, to be cautious of strangers, to watch out for “bad men with guns” (that last one may be unique to Pakistan, of course). A few months ago I had to tell my son about “good touching” and “bad touching”, making him aware of the perils of child abuse. It is heartbreaking, yet apparently it is also responsible parenting. I can think of no stronger evidence for the brokenness of the world than the fact that as loving parents we need to teach our children to be suspicious, to a certain extent at least, of strangers. They grow up with a soft and fluffy worldview, living in a world of sunshine and smiles, only to be confronted with the fact that in order to eat meat for dinner, a chicken has to be butchered and die messily in a blue bucket. Christians, of course, look past this world to another one, a place of renewed perfection, which we await eagerly. I bet the chickens do, too. 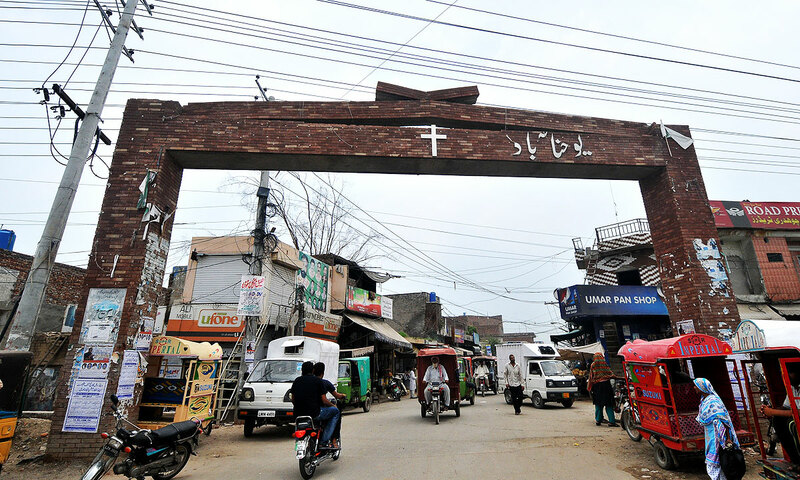 Youhanabad means “City of John”. I have visited it a number of times over the last few years; it is probably the biggest Christian population centre in the whole of Pakistan. The level of Christian dominance seems strange. Shops and pharmacies are usually given Islamic names – “Mashallah Pharmacy”, “Bismillah Cold Drinks”, that kind of thing – but when I was walking through the packed streets of Youhanabad a few years ago I noticed a shop with “Jesus Christ Pharmacy” written in large type over its door. “Isn’t this strange?” I asked the owner when I went in to buy some Calpol for a sick child. “Why?” he replied. “Everyone here is a Christian”. This explains why, on Sunday 15th March, two suicide bombers decided to attack it. They approached the gates of two churches – one Catholic, one Protestant – and detonated their devices. 17 people are dead. Far more would have died, except that security guards wrestled with the attackers and prevented them from entering the compound; in doing so they gave their lives for the protection of those within, thereby providing an illustration, in the city of John, of the words of Jesus in the gospel of John: “Greater love has no man than this, than to lay down his life for his friends”. Christian anger spilled over into the streets as Christian blood spilled over into the gutters. A mob formed, and two passers-by, wrongly accused of being part of the terrorist team, were lynched, and their bodies burned. Cars were smashed, rocks thrown, roads and motorways blocked as hate spilled out into the streets. In doing so the protestors in the city of John failed to heed the words of the apostle John: “Whoever loves his brother abides in the light…but whoever hates his brother is in the darkness and walks in the darkness”. Get a good teacher. A good teacher ought to encourage you, praise your faltering efforts to master the language, and not laugh at you too much when you confuse the word for “stomach” with the word for “buttocks”. Set aside two years of your life, at a minimum, to study it full-time. Move to Pakistan. It makes sense to learn Urdu in the country where it is spoken. On the downside, you will find yourself studying in 40 degree heat with frequent power cuts. On the upside, you get to eat parathas. 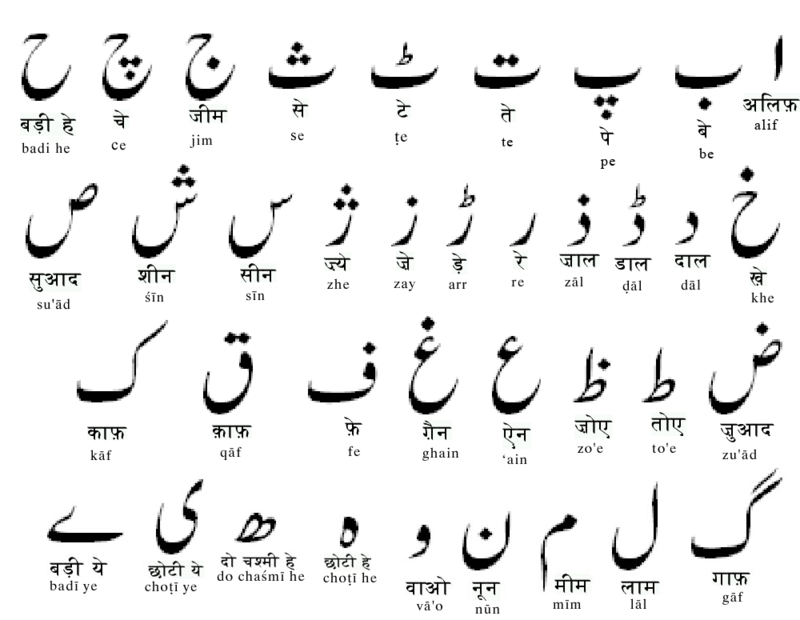 Try not to be put off by the fact that Urdu script has three different characters for “s”, four for “z”, three for “t” (two of which are minutely different), and a special character which doesn’t make a sound but which tells you to exhale slightly as you say it. When you first try to do so, you will be laughed at (see above). Also try not to be put off by the fact that when you use the wrong kind of “s” when spelling a word, people will laugh at you. It doesn’t matter that it’s pronounced the same, nor that the two letters are effectively interchangeable, you are still wrong. If you can deal with all of these, you will reach the majestic point at which you can easily navigate the bazaar, chat to all and sundry, and be met with the glorious compliment: “Mashallah, you speak Urdu very well!”. One night in June I started to feel pain in my stomach. This is common around here, what with the tap water containing more bacteria than a microbiologist’s petri dish, so I thought little of it. When the pain got worse, and then even worse, I started to wonder if I should do something about it. 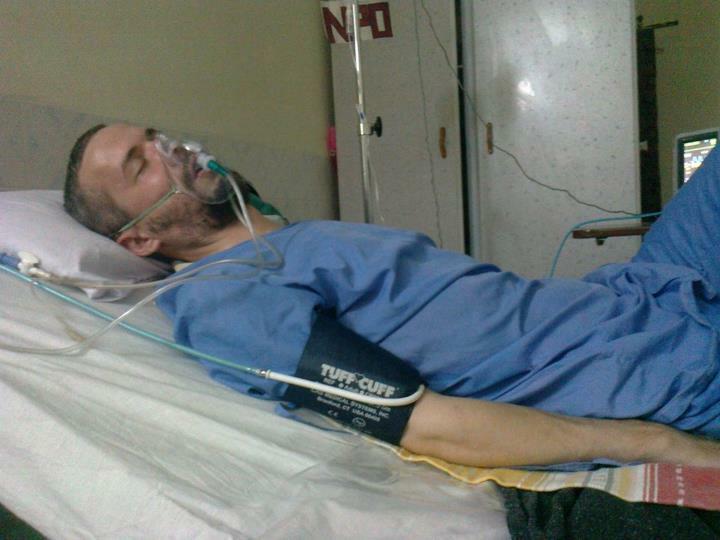 And when it became unbearably painful I asked a friend to drive me to a hospital in the mountains, some three hours away. That journey, over bumpy mountain roads in the middle of the night with me vomiting into a bucket every fifteen minutes, is a story in its own right. To cut a long story short it ended up being a very serious problem indeed which required some particularly invasive and unpleasant surgery on my intestines. This required a two-month period of convalescence in the UK, as it was 45 degrees in our home city in Pakistan, a temperature not exactly conducive to recovery from a major illness. We flew home and spent two months resting, eating good food, visiting family and friends, and trying to persuade people that we couldn’t wait to return to Pakistan again.